Totally Hot Oriental is a collection of vintage to modern music for bellydance performance personally selected by world-famous bellydancer Sadie. Totally Hot Oriental is a collection of vintage to modern music for bellydance performance personally selected by world-famous bellydancer Sadie. 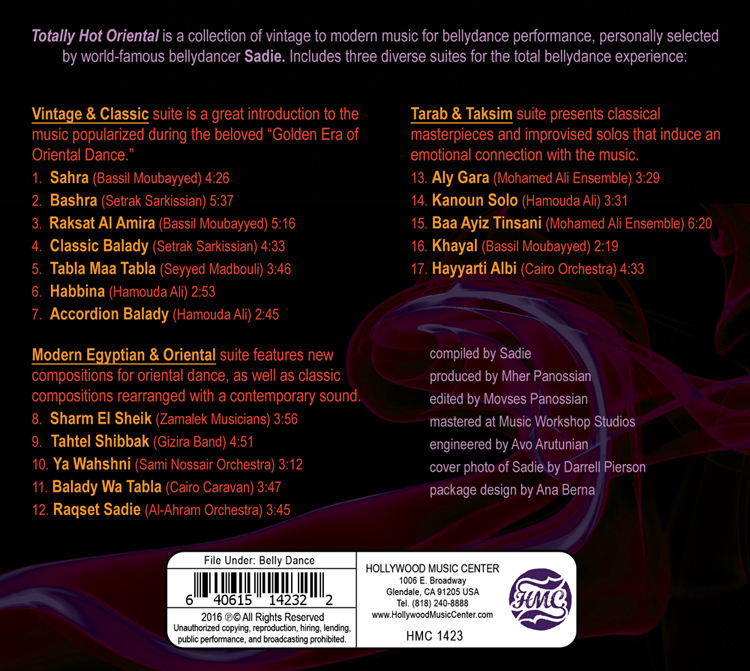 Includes three diverse suites: The Vintage & Classic suite is a great introduction to the music popularized during the Golden Era of Oriental Dance; the Modern Egyptian & Oriental suite features new compositions for oriental dance as well as classic compositions rearranged with a contemporary sound; the Tarab & Taksim suite presents classical masterpieces and improvised solos that induce an emotional connection with the music.